May's discussions on teaching philosophy, format, residency community, pedagogy (or lack thereof), and even life after the MFA held priceless information that helped to direct me to programs that will best fit what I need and desire…. Highly and strongly recommended to anyone considering a low-residency MFA program. 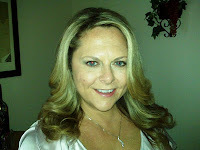 Kudos to Lori May for putting together such an informative, concise piece of work! Recently, on her Inspiration for Writers blog, Rhonda shared her experience as a first-timer in a low-res program. From her research, Rhonda selected – and was selected by – Converse College. I was so pleased to hear about Rhonda’s program acceptance and her entrance into Converse, I simply have to share her excellent blog post about what it’s like to take the big step. I had no idea what to expect when I arrived on the idyllic campus of Converse College for my first semester in their MFA in Creative Writing Program. I was nervous about meeting my dorm-mate (Me? Staying in a dorm? With a total stranger? At my age? ), who turned out to be a spectacular poet, mother and now my sweet friend. I wondered if I’d be accepted among a group of sixty students, forty-five of whom already had a history together, or if the professors and visiting authors would look down from their lofty positions as they berate my writing. After all, these people were real writers—authors whose names I recognized, whose novels and poetry collections sit on my bookshelves even now. These same instructors and brilliant students are now my friends: we touch base via email, follow each other’s daily lives on Facebook, share links to interesting blog links and sometimes chat on the phone about everything from a class assignment to a great novel we’ve read to a recipe you’ve just got to try! Breakfast in the dining hall (surprisingly yummy food), begins at seven and lasts until nine, and you are welcome at a table with your cohorts, or you might want to sit with a professor or a visiting author to chat about, oh, anything. Before the first session of the day begins following breakfast, students can attend one-on-one meetings with their faculty mentor to discuss the semester syllabus, to brainstorm about a current project, or to chat about suggestions for their reading list. On some days, student group meetings are held in this time frame, as well. If students don’t have a scheduled meeting, they’ll often use this for a leisurely chat over coffee, free writing time, strolling the campus grounds (beautiful gardens, impressive statuary and quiet nooks for settling in with a good book). The day’s first craft lecture follows. Doesn’t this sound boring? I mean, come on, a craft lecture? Let me tell you, these things are amazing! This semester, Dan Wakefield taught us using his late friend Kurt Vonnegut’s fiction, authors Leslie Pietrzyk (my mentor this semester—Yay!) and Marlin Barton gave inspiring lectures on story beginnings and using violence in fiction, and national bestselling author Robert Olmstead lectured on how characters’ thoughts can change the whole direction of a story. Powerful stuff, and these were only a few of the fiction lectures! “But wait,” you say, “do you mean you studied things other than fiction in a fiction program?” Absolutely! One of the reasons I chose Converse is that students are encouraged to attend lectures by professors outside their primary genre. Not only does this present inspiration in directions you might not have considered, but it provides a broader scope should you decide to teach in the future. Hence, I enjoyed seminars by phenomenal poets Denise Duhamel, Suzanne Cleary and Albert Goldbarth. I also benefited from seminars, lectures and readings by guest faculty and speakers, including Brock Clarke and Marshall Jon Fisher and faculty Susan Tekulve and our amazing program director Rick Mulkey. A leisurely two-hour lunch followed each day’s first seminar, when you’d hear chatter and laughter throughout the dining hall and across the campus as new relationships budded and old friendships grew fonder. Of course, some of this two-hour period was usually spent writing or reading, digesting not only dessert but the instruction and information we’d received in our day’s first lecture. A walk in the sun across the campus green led us to our afternoon workshop. Workshops are broken into genre—fiction, non-fiction and poetry—and each workshop includes only five to ten students and one or two professors in a roundtable setting. It’s here where the real work occurs, where students watch their skills grow like magic and their writing improve before their eyes. No kidding. I’m still amazed at how much better my writing was on the last day as compared to the first day. Not only were we instructed in methods to improve our work, but we applied those things to our writing and discussed what worked and what didn’t. Workshops were very “hands on,” and over the course of the residency, each student had an hour’s discussion and constructive critique of their own work by the workshop instructors and fellow students. Instructors welcomed our questions and encouraged each student to offer feedback and share their opinions of the selections we read and the writing exercises we completed. A second stimulating lecture period followed our craft workshop. Some days, these periods consisted of events like a panel discussion of authors or even a sit-down Q & A with Algonquin Publishing’s Executive Editor Chuck Adams. Receiving this kind of insight into the world of publishing is critically advantageous to a developing author’s success and, as students, we were ever aware that we were being provided a “secret map” that will guide us through the tangled jungle of submission and publication. Dinner (and more laughter) follows this last lecture of the day, then we’re treated to an hour of guest speaker, faculty or student readings. The readings are casual and comfortable, and some of the stories and poems shared take us from hilarity to tears and back again. The night’s readings end with a social hour, which tends to morph into social hours. As our ten-day residency progressed, these social gatherings grew longer as our conversations grew deeper and our friendships became stronger. A few at a time, students and faculty disbursed to grab a snack, study, write, or do a load of laundry. The common areas of the dorm (usually the veranda) always remained a social meeting place, however, even into the wee hours. Get an idea you need to bounce off someone? Head to the veranda. Can’t think of a word you need to complete a rhyme in your sestina? Head to the veranda. Can’t finish your bag of popcorn? Don’t worry, your friends on the veranda will devour it for you. Eventually—sometimes as the sky begins to brighten again—the rocking chairs slow, and the last few upright writers head to their beds and dream of new stories before time to rise and do it all again. Too soon, our residency ended, but the flame of passion for writing still burns strong as each of us work from home to complete our semester assignments. We study the novels and books on our individualized reading lists. We write critical theory papers about what we’ve read, discerning what works and what doesn’t in those stories, and deciding what we’ve learned that we can apply to our own writing. We also write our own stories or essays or poems—creating packets that we’ll send to our mentor every three or four weeks. We stay in touch with our mentors and our cohorts, and always, we look forward to the next semester, when we’ll be together with our like-minded, creative family at Converse. Thanks to Rhonda Browning White for the permission to repost this excellent description of a first-timer’s experience in a low-res program! Learn more about the Converse College MFA program here. 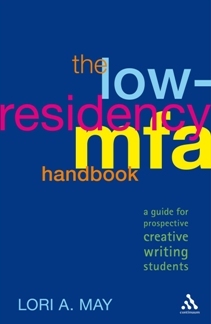 Buy a copy of The Low-Residency MFA Handbook on amazon. If you have a low-res experience you'd like to share, email lori@loriamay.com. This Friday, October 14, I’ll be reading poetry and nonfiction at the annual Michigan College English Association (MCEA) conference. The full day of events begins at 9:30, with my reading taking place 11am-12:15pm. A full schedule and registration forms are available online here. The theme for the 2011 Michigan College English Association Conference is “Taking Risks” and will be held the campus of University of Michigan – Dearborn on October 14, 2011. The conference is at the Fairlane Center Campus, 19000 Hubbard Drive, Dearborn, Michigan 48126. Registration begins at 8:30. Sessions run from 9:30 to 3:15. This year’s keynote address, entitled “The King James Bible in Contemporary American Works”, will given by Professor James Vanden Bosch. Vanden Bosch has taught English at Calvin College for over twenty-five years, with a special interest in English grammar, grammar for ESL teachers, corpus linguistics, and Cormac McCarthy’s fiction and drama. He regularly teaches short courses in Moscow, directed a semester-abroad program in Budapest, and recently taught in Lintong, China. Vanden Bosch has degrees from Calvin College, Ohio University, and the University of Chicago Divinity School. At Calvin, he has been named the Professor of the Year (2001) and has won the Presidential Award for Exemplary Teaching (2010). This 400th anniversary of the King James Bible has prompted Vanden Bosch to explore the influence of the King James Bible on several contemporary American writers. 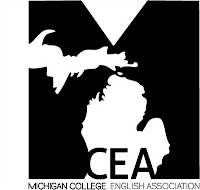 MCEA is a state affiliate of the College English Association and sponsors an annual conference dedicated to promoting the above goals. For more info, visit http://www.michcea.com/.